Our readers are your customers! 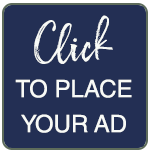 Potential advertisers, give us a call today to learn about placing an ad in the next issue. Although we are now publishers of The Country Register, we first learned of the publication when we owned a small craft shop in western Pennsylvania. We advertised in The Pennsylvania Country Register and the results were amazing! The customer response to those ads was much greater than from any other advertising media we had tried. The customers made it a point to tell us that they'd found us in The Country Register, and would keep coming back to see what was new at the shop and to pick up the latest issue. After watching this happen for over six months, we noticed that Maryland did not have a publisher for The Country Register. We contacted Barbara Floyd, originator of the paper, and quickly went to work becoming the publishers of The Country Register of Maryland. 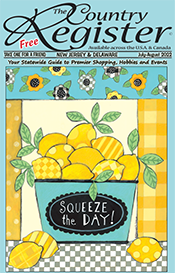 We have since sold the craft shop, moved to Maryland, and are concentrating on our publishing enterprise, which now includes The Country Registers of Maryland, Delaware & New Jersey, and Indiana. We have never had so much fun in our lives. We have been self-employed for over 20 years, but have not always enjoyed our jobs. But The Country Register is all about good news! It is the only statewide publication for Country & Victorian, Antique and Collectible Shops, and Arts & Crafts Shows and Events. Each issue is filled with wonderful recipes, articles about our great advertisers and by writers who work exclusively for The Country Register, helpful hints and ideas, etc. The nicest people own the types of shops that advertise with us, and those are the folks we get to deal with every day. It is so much fun to find a small shop well off the beaten path and send them new customers. (One shop had seven new customers walk through their doors one weekend, all carrying our paper!) In addition to the shopkeepers, we also get to interact with our readers. We have a loyal following who take day trips or longer jaunts to areas they have read about on our pages. They truly enjoy the paper and write to tell us so, sharing comments, recipes, and favorite stories. Our hope is that you will enjoy the paper, too—as much as we enjoy bringing it to life.